The Series 7923 acrylic flowmeters are an ideal low cost tool for measuring flow rates of inert and non-reactive gases. The 1/8” female standard inlet and outlet connections are contained in brass inserts to ensure a leak-free connection to prevent cracking of the acrylic body. 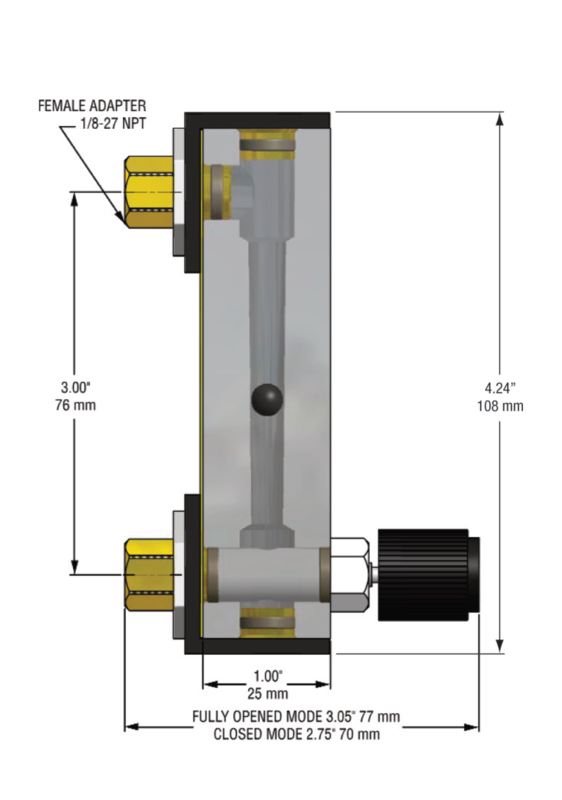 A needle valve to control the flow rate is included. Flowmeters have a dual scale for air in SLPM and SCFH. * All calibrations are for air @ 0 psig outlet and 70° F.
1/4" hose barbs inlet and outlet - add suffix "4HB." 1/4" compression tube fittings inlet and outlet - add suffix "T4FF." 1/8" compression fitting inlet and outlet - add suffix "T2FF."